All Reconditioned Vacuum cleaners come with a full 12 month Warranty and have new parts fitted. The Dyson DC25 has a new cleaner head filters hoses and tools. Making the machine vertually brand new at a fraction of the cost. Please note all though the cleaner will be the exact same the colour may vary and there may be slight signs of wear to the vacuum so please note the image is for illustration purposes only. Lightweight Dyson Ball vacuum cleaner designed for cleaning every floor surface. DC25 Multi Floor is a lightweight Dyson Ball vacuum cleaner that uses patented Root Cyclone technology for no loss of suction. It has been engineered for powerful cleaning of every floor surface, with a motorised brush bar that can be turned off for hard floors and delicate rugs. DC25 Multi Floor also includes patented Ball technology, which allows you to steer with ease around obstacles such as furniture and household appliances. It rides on a ball, so there's no more pushing back and forth to turn corners. At just 7.4kg, DC25 All Floors is one of Dyson's lightest full-size uprights. The motor is housed inside the ball to lower the machine’s centre of gravity. Have you ever got frustrated pushing an ordinary upright vacuum cleaner back and forth, back and forth to steer around furniture and other obstacles? Have a look underneath it, and you'll see that's because it sits on fixed wheels – perfect if all you want to do is travel in a straight line, but not so good at corners. Frustration is an important source of invention for Dyson engineers – it sparks new ideas, new ways of solving problems. It was their frustration with fixed wheels that led them to develop a new way of turning corners. Dyson Ball upright vacuum cleaners use patented Ball technology to overcome the steering limitations of fixed wheels. They ride on a ball, which pivots around itself so you can steer with ease, changing direction with just a turn of the wrist. The idea for Ball technology came about from a Dyson engineer studying new ways to steer. It started crudely - an old wand handle attached to a wheel. Eventually the wheel became a ball - and an ideal home for the motor. The ball itself is made of glass-reinforced polypropylene – the same material used in the manufacture of car dashboards. It combines high impact strength with resistance to distortion. The ball is also where you'll find the motor. By putting the motor inside the ball, at a neutral point, Dyson engineers were able to lower the machine's centre of gravity and improve manoeuvrability even more. DC25 Multi Floor has a motorised brush bar for removing dirt and pet hair that have lodged deep inside carpets. The stiff bristles on the brush bar spin at high speeds - up to 90 times per second – to agitate the carpet pile and dislodge dirt and pet hair so that it can be vacuumed up and removed. Don't worry if you also have hard floors or delicate rugs – the brush bar can be turned off so you can use DC25 Multi Floor on these surfaces too. When you want to clean awkward-to-reach spots like stairs and ceilings, you can use the quick-release wand on your DC25 Multi Floor. It extends by 16ft quickly and easily, with no awkward components to assemble. You can also attach tools and accessories, extending your cleaning abilities even further. DC25 All Floors includes a sealed HEPA (High-Efficiency Particle Air) filter – the same filter used by hospitals – to trap tiny particles as small as 0.1 microns. That's about the size of a single particle of cigarette smoke. Particles this small include common household allergens such as pollen, mould spores and dust mite faeces. The air expelled by DC25 Multi Floor contains up to 150 times less mould and bacteria than the air you breathe. And because the filter is washable you won't need to replace it. Just give it a rinse once every 3 months with cold water. delicate rugs and hard floors. The bin on a Dyson vacuum cleaner is transparent so you can see when it needs emptying – and just how much dust, dirt and pet hair your new Dyson machine has picked up. Emptying is quick and hygienic – just press the button to release the dirt. Dyson upright and cylinder vacuums are approved by 12 allergy associations worldwide, including the British Allergy Foundation (BAF) and Allergie Suisse. Allergie Suisse approval is one of the most stringent in the world. To secure, it vacuums have to provide constant suction and separation performance so that they don't lose effectiveness while you clean. The bags in ordinary vacuum cleaners clog with dust and dirt, causing a loss of suction. After a while the suction can fall so low you have to replace the bag – and throw the old one away. A lot of vacuum cleaner bags these days are made from a mixture of plastic and paper, which means you can't recycle them. Like a lot of waste, they end up in landfill, where they take years to decompose. With a Dyson vacuum, you can simply detach the clear bin and empty it onto the compost heap. Biodegradable dust and fluff will be broken down naturally into useful fertiliser. With no bags to replace, you won't be adding to the landfill problem. Other vacuum cleaners are still designed to need replacement bags and filters – and the cost soon adds up. Over 5 years, you could end up having to spend up to £175. Dyson vacuum cleaners don't need bags and have lifetime washable filters, so there are no extra costs to worry about. You'd be amazed at some of the tests Dyson carry out on their machines to make sure they're as tough and reliable as possible. 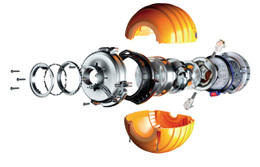 During development, a push/pull rig moves Dyson vacuum cleaners a minimum of 4,452,651 feet. The hose is kinked 7,280 times. The bin is opened 1,560 times. Upright vacuum cleaners undergo 207 different validation tests, cylinders 235. That's why Dyson are so confident in their machines they guarantee all their uprights and cylinders for 5 years – parts and labour. Root Cyclone technology for no loss of suction. Dyson engineers are constantly testing and inventing, trying to find new ways to make their technology work better. As they work, they file patent applications to protect their inventions from copycat manufacturers. That's why the only place you'll find Dyson technology is inside a Dyson machine. Ordinary vacuum cleaners rely on bags and filters to trap dust and dirt. Air is meant to flow through tiny holes, leaving dust and dirt behind. The problem is that when you use them, these tiny holes quickly clog up with particles of dust. This chokes the flow of air, so the vacuum cleaner loses suction. Dyson vacuum cleaners don't rely on bags to trap dust and dirt. They use patented Root Cyclone technology, which spins the air at high incredibly high speeds. 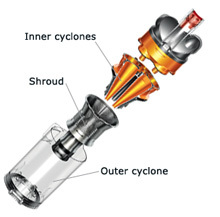 The cyclones inside a Dyson vacuum cleaner generate centrifugal forces many thousands of times the force of gravity. Dust, dirt and pet hair are flung out of the airflow and straight into the clear bin. No bags, no loss of suction.